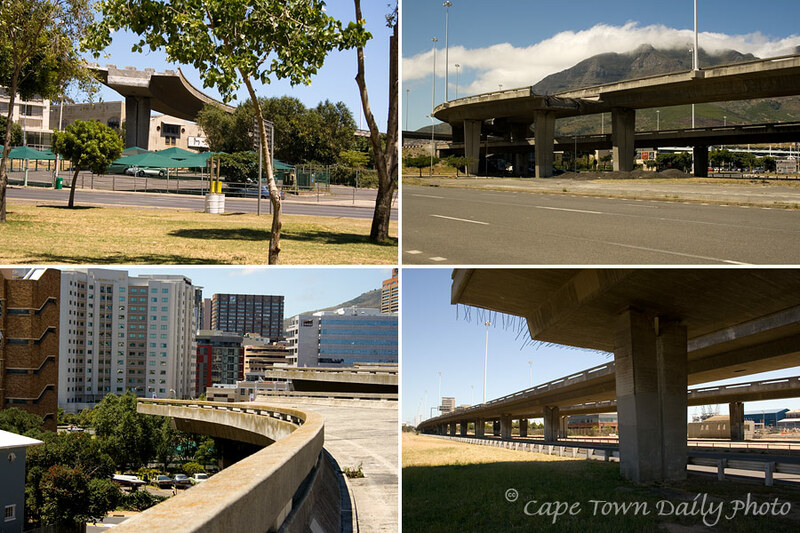 For today's theme, we could have shown you one of the covered pedestrian bridges over the highway, or a pretty little wooden bridge over a forest stream, or the romantic old Woodbridge Island bridge... but instead we decided to post something that would bring a smile to the face of every Capetonian reading this: a collage featuring the unfinished highway bridges on the Foreshore. We love these bridges - they've become a feature over the past 20 years, and despite what we may say to the contrary, if the truth be told, we'd all be rather sorry to see them completed. Where else would bands shoot cool music videos? Where else would graffiti artists go to express themselves? How else would you explain to people how to get to your guesthouse? And, honestly, what else could have been an appropriate setting for the final scene of this little movie? Posted in General on Saturday, 1 December, 2007 by Kerry-Anne.